Little Miss, Held forever in our hearts. Blue January 14, 1996 – April 18 2009. 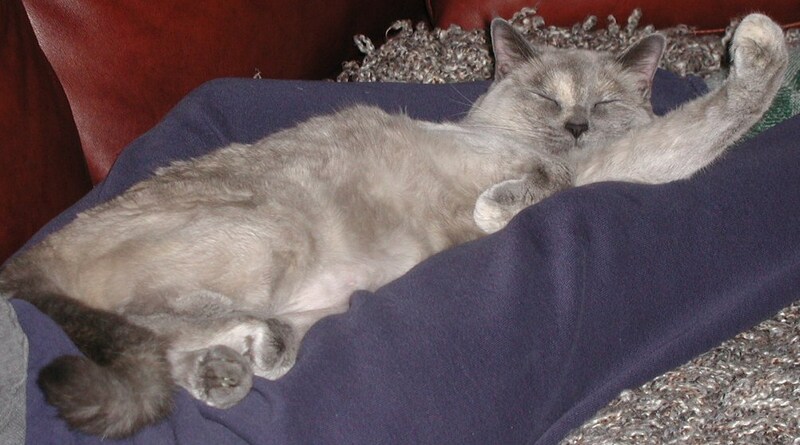 April 18, 2012… the third anniversary of the passing of my most beloved Kitty Girl Blue. I lost 10 lbs. in two weeks watching her go. 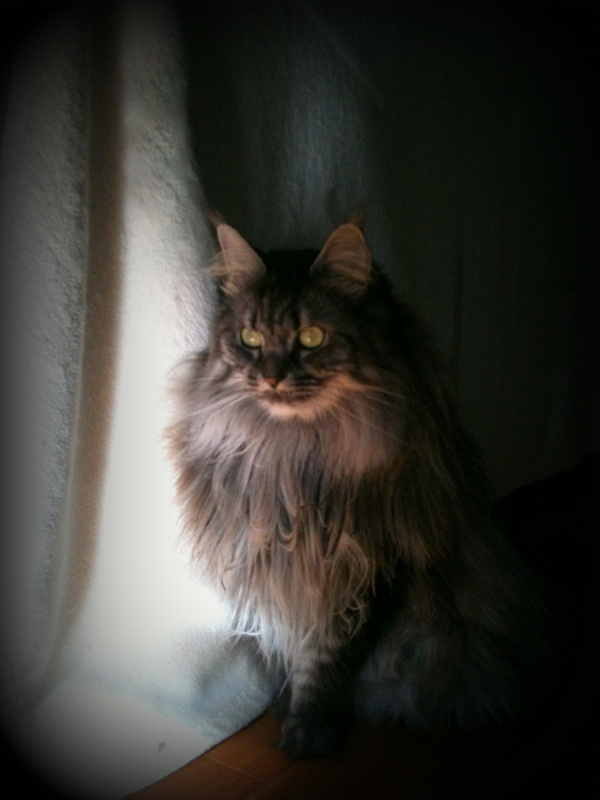 I had not known she was sick and suffering from Hyperthyroidism, it went undetected, until 18 days before she passed. I also didn’t know that she would not react well to the medicine provided by my veterinarian’s office. Loosing my lively spirited Blue, is one of my life’s most painful losses. “She” is dedicated in her loving memory. Tears still flood my eyes. My husband and I adopted her as a 6 week old kitten from a farmhouse down the road. She was half feral and half Birman. 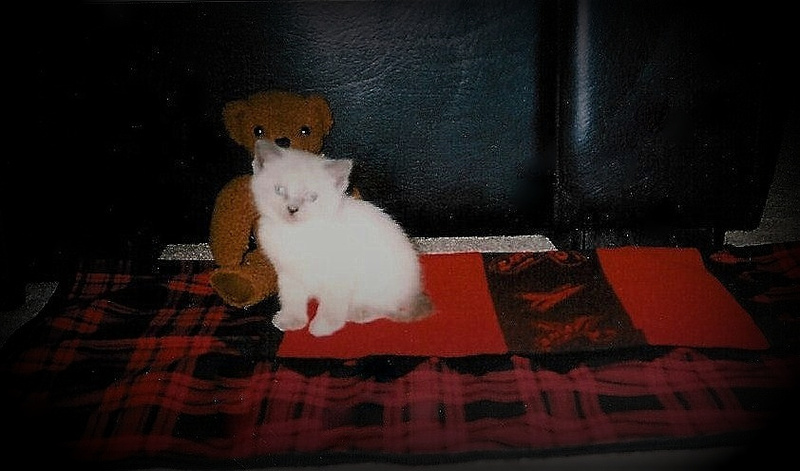 She was a sick kitten that became a sick cat, however, we knew that we could give her the best care and chance, we had 13 years with her. Our vet always referred to her as “the front page” cat, this referral came since she was on his front page of the most wild cats he had ever seen. He wore large thick leather grilling gloves when he cared for her, lol. Yes, she was an indoor cat, and eventually became adjusted to my husband and me over the years. The first time I saw her sleep and lay on my lap was at 5 years old, she stayed for 2 hours. I didn’t move, I just relished the event and knew that years of patience had finally won her love. Blue was my little girl I never had, my heart was stolen and was never to be the same. We lived on a 20K acre lake and saw our share of water-moccasins. One day she killed one at the front of the house in the shrubs as we were taking our morning walk. She earned “Princess Blue” status from that point on. After she killed the snake, I killed it unnecessarily further with a garden hoe. It was quite the experience. She was not on a lead outside since she was such a good follower. This led to the day my husband and I spent hours with two extended ladders up a tree trying to rescue her after neighborhood dogs frightened her up into a very tall pecan tree. I also convinced my husband there would be no bugs including mosquitoes in our bedroom if she would sleep at the end of our bed. This of course wasn’t true, but she spent the next 8 years sleeping in the high arch of my foot each night. It was true comfort for me. I should mention, she loved yogurt. She has her own song, which I will share one day with you. I wrote it in rush hour traffic in Dallas on the way home, really. It’s a children’s song that I plan to use in a book one day. 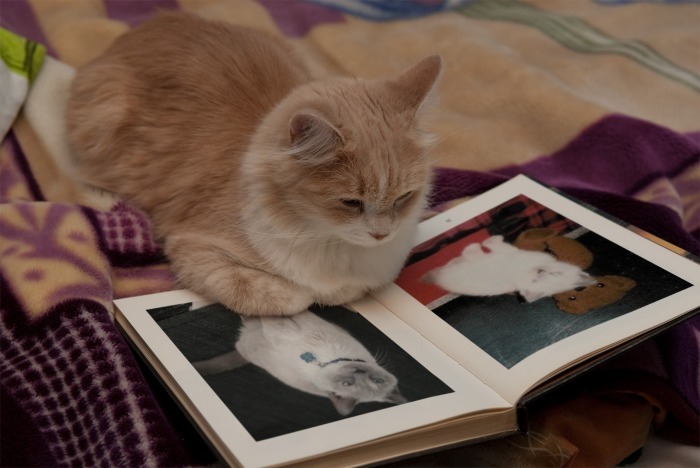 She has a beautifully shaped kitty urn and sits in my library, the best book there with well-worn chapters. There are hundreds of stories to tell, but I really want to leave you with a few pictures that tell her story. Cherished memories of a beautiful love story. Feeling the love after a long grooming. 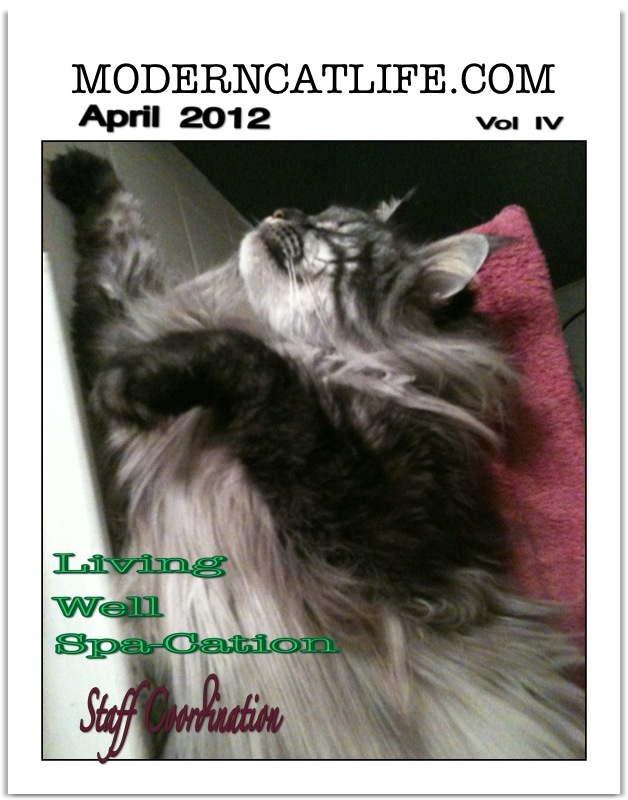 Twilight’s look lends itself perfectly to the April cover of living well. We spend several minutes in the morning and in the evening making sure she is tangle and mat free. This warm spring has been particularly challenging as she creates several “mini me’s” with each brushing. Twilight wanted to say a few words about long hair requirements. It is so important to allow my Mommy daily grooming time. You see, I sleep so much during the day, rolling around in my bed and grooming as needed. Somehow, I create tangles and mats in my long flowing coat that start to hurt if they aren’t managed on a daily basis. The good “mews”, I love being brushed and combed. It relaxes me and takes Mommy away from my sister Grace. Grace and I always compete for her time, but I don’t think she knows. I love staying at home at the spa at Eden Close. 5 Paw rating for the spa and so much more. Any-who, I’m off for nap-time, another lesson we can talk about later. Twilight, so gentle is the love from my feline friend. My heart leaps with joy from her sweet affectionate ways. 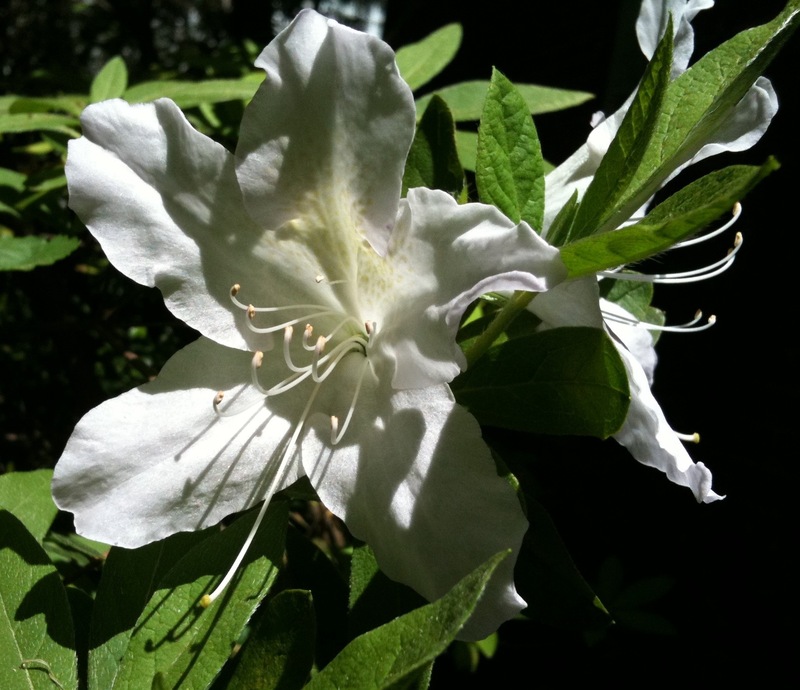 Spring Cup Runneth over; Grace is my God’s gift, Twilight my evening’s song. Gentle, peaceful and kind is his treasure in my heart. 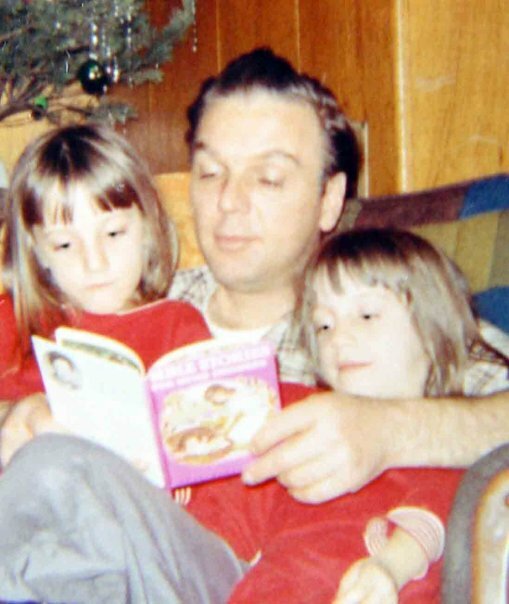 For Randy, Grace and Twilight. 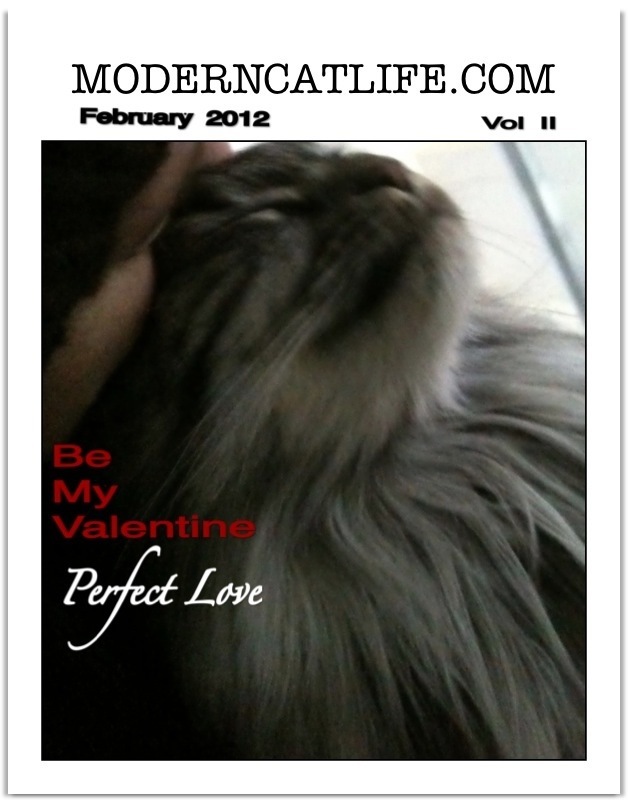 Twilight, February’s cover kitty. I have the pleasure of loving her everyday, and on Valentine’s Day I asked her these questions. Twilight, Do you think being a mommy has made you so loving? Twilight, what is your favorite way to show love today? ” I love, love, love time spent with my special person in the morning, grooming time runs right into kisses and love nudges. It really starts my morning off on the right paw! Thank you Twilight for your unconditional love. Hello, Grace here, It’s dark outside and we are sitting on the screened in porch. Officially it’s called “The Porch at Eden Close.” Anyway, Twilight and I are listening to the night noises, and enjoying the cushy comfort of the wicker rocking chairs. The fresh air is good and the best part is our Mommy, Melinda is sitting with us enjoying 60 degrees – a beautiful February evening in southern USA.